Carmi has turned a vintage watch face into a bracelet component. 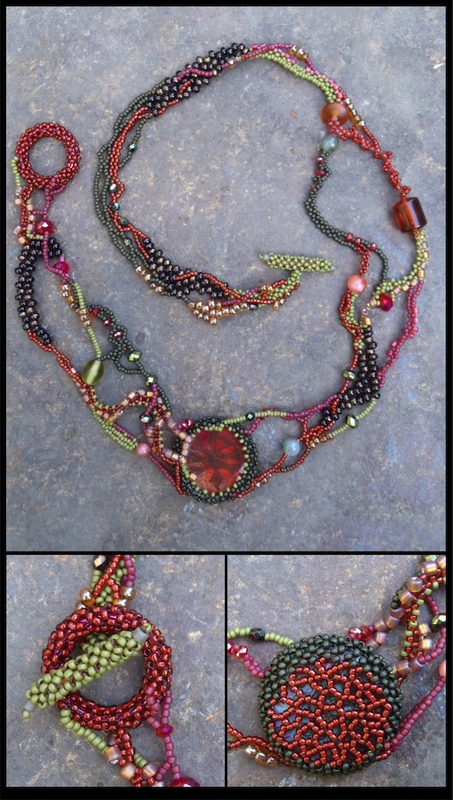 Melanie pairs some new woodland inspired components with gorgeous chain from Fusion Beads. Black and white resin looks beautiful! Jean has two cool offerings for you to check out today! See her blog for a fab new book and of course the challenge she is in! Andrew shares the inspiration behind a few of his new pieces, recently added to his store! Is it time to return to the jewelry classroom? If so, here are some suggestions for you. 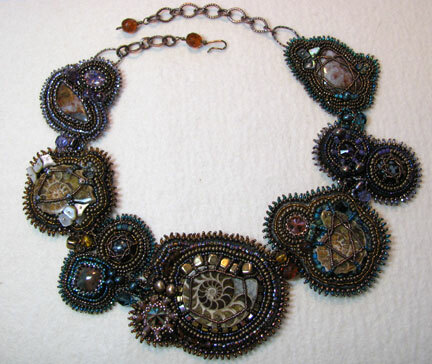 Heather provides a beautifully sunny forecast for summer's jewelry making trends! I love sharing new artists with you, but I don't want to forget about the ones we've already visited with! Especially because new people are joining our happy little band of bead and jewelry crazies every day, and they may not have seen these terrific artists! Please drop me a line if you'd like to share your work! There's always room for more :-) Just email cyndi @ mazeltovjewelry.com (remove the spaces) anytime. 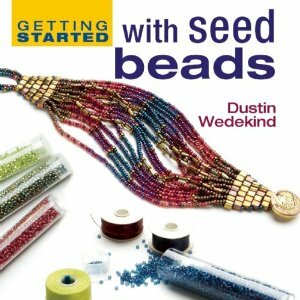 Here are all the seed bead tutorials from the archives, both off-loom bead weaving and bead embroidery. Some of these are quick and dirty techniques, and some follow a larger project from beginning to end. Enjoy! 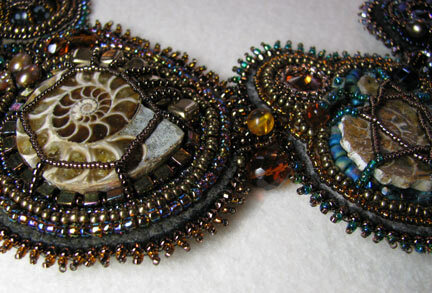 Last week, I walked you through the initial steps of constructing my new ammonite bead embroidered necklace. This week, we'll finish up, and I'll once again ask for your help in naming it! 8. I added stacked stitch as embellishment all the way around the edges (edging brick stitch), both inner and outer. Instructions for edging brick stitch and stacked stitch can be found in Chapter 1, my free e-book chapter. 9. Here is a detail shot of the edge. 10. 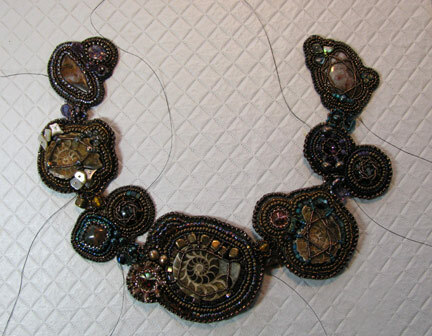 I used size 11/0 and 15/0 seed beads for this embellishment. 11. 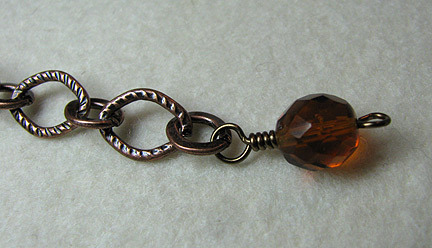 Hammered oval links were added to the two ends of the necklace with a square stitch bail on the back. This bail style is covered in Chapter 3. 12. 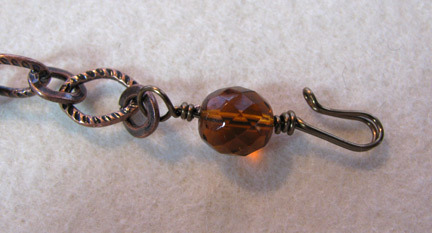 Make a hook for yourself from wire or choose an appropriate hook and attach it to some heavy chain. 13. 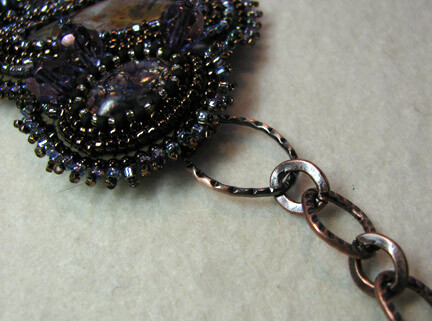 Make a dangle to finish off another length of chain. 14. Attach the chains to the hammered ovals. 15. Complete! Now what to name it? I've gotten some great suggestions, and I've got to get on the ball and pick one now! Cyndi has gotten inspired by Spring Fever! Has that ever happened to you? Do you have some work you'd like to share? Melanie creates a new necklace kit design, buzzing with flying creatures and blooming with leaves and trees to celebrate spring. Jean has to solve a very big bead problem and gets some help from an extremely inspirational (ahem) source! Oh, for the love of buttons!! 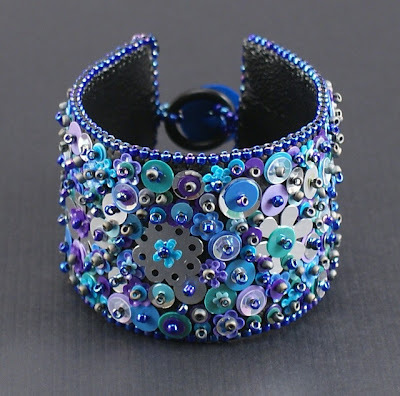 If you love buttons stop by A Bead A Day to spread the love and obsess a little! Tammy pulls out a previous interview of a jewelry designer who makes jewelry for celebrities. My work is bold, colorful, and detailed. 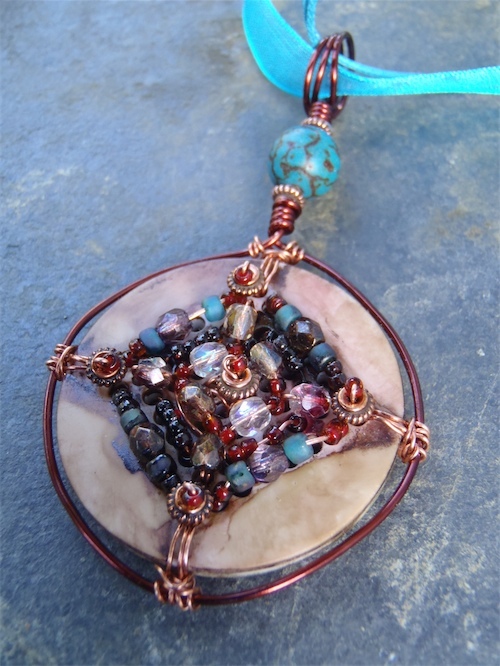 I don't stick to a particular style or type of jewelry making – I like to let my imagination run wild. Sequins tend to be a common theme in my pieces, though, which is one reason I picked the name Saturday Sequins. I start out with a very basic idea in mind. A shape, some colors, the type of metal I'll use, if any. From there, my work is improvisation. I fit my components together like puzzle pieces until I come up with something I love. My favorite place to work is on the couch in my living room, with my supplies spread out everywhere. Once I get started on a project, it's hard to stop, even for things like food and water! I tend to work alone, but I don't mind having other people around, either. My husband, Mr. Sequin, is very good beading company. Besides taking a handful of classes at the Bead and Button show from some really awesome teachers, I don't have much formal training in jewelry making. A lot of what I do comes from experimentation, trial and error, and good books. I have plenty of informal training, though. 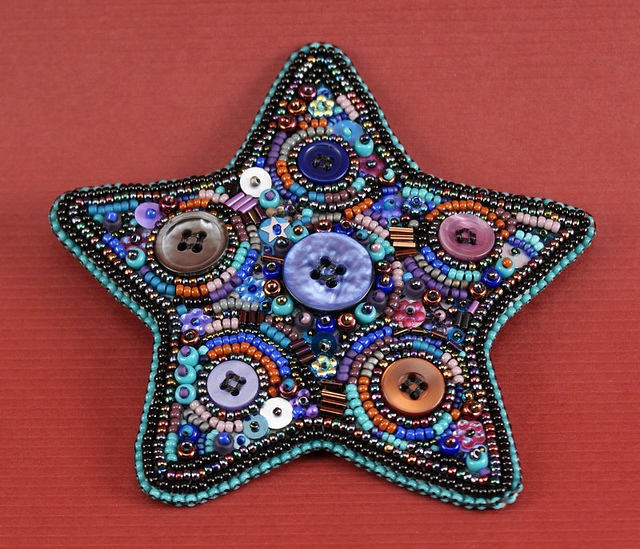 I've been beading since I was nine years old, and in college, I experimented with wire work, abstract painting, traditional embroidery, and bead weaving instead of studying (oops!). I'm always trying out new arts forms, and I love finding ways to combine them in my work. Sequins, definitely! The thing I like most about sequins, besides their sparkle, is their versatility. I can combine them with just about any form of jewelry making, and they lend themselves to a lot of different styles, from fun and funky to casual to elegant. Two little words inspire me to create: What If. I'm a curious person, and it borders on obsession. I'm always wondering what will happen if I try this new technique or combine these colors or incorporate this crazy material. I'm happy when things work out, and when they don't, I'm excited to see if I can make them work another way. What keeps me going is the knowledge that if I keep my eyes open and my mind ready, I'll find a way to get through a rough patch. At this point, I have enough experience to know that the solution to a problem will come to me, and it will probably be something unexpected. And simple. And if the solution takes its time, which can sometimes happen, I know that there's always something else I can work on. That's the really great thing about art as a business and by itself – there are so many facets. Don't be afraid to play and to make mistakes. This goes for the artistic aspect of jewelry making, but also for the business side. It's by playing around that you find what works best for you. It's by discovering what doesn't work, in addition to what does, that you grow and become the artist you were meant to be. In fact, as wonderful as our successes are, it's our mistakes and failures that teach us the most. They aren't the end of the world! They're the beginning. I spend time with my husband, who is my best friend in the world, and my friends. We like to get together, make and eat amazing food, and talk about our latest creative projects. I'm also very involved in the blogging community, and this summer, I plan to spend a lot of time hula hooping in the park and helping Mr. Sequin with his garden. What's your favorite comfort food? My favorite comfort food is spinach artichoke dip. If I'm not careful, I can eat the entire batch in one sitting! Do you love Diane Fitzgerald and her amazing work as much as I do? You'd better, or else let me tell you...you're just plain wrong! 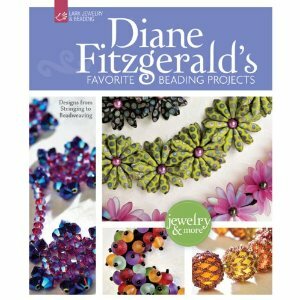 In this beautiful brand new Lark publication, Diane Fitzgerald's Favorite Beading Projects, Diane shares 24 never-before-published projects that actually span both her incredible 20 year career and her amazing technical skills. 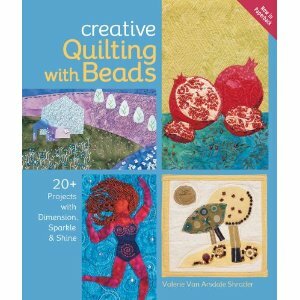 If you've ever wanted an introduction to beading like Diane, this book is it. It would be great if all of us could actually take a class from her, but since that's not practical for some people, here's your chance to have Diane sitting right with you as you work through her projects. I would recommend this especially for beginners or advanced beginners who would like to be challenged to broaden both their skills and the materials they work with. The instructions are easy to follow and have great tips included for creating your own variation on her projects. 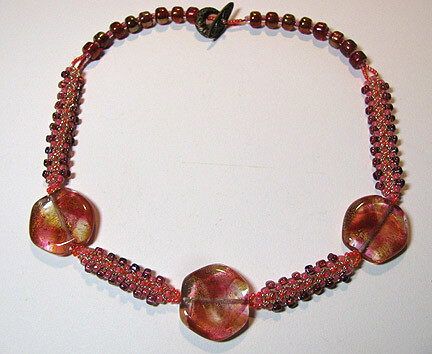 Crystals, seed beads, Lucite, pearls, two-holed beads, fabric, fused glass, lampwork beads, buttons, pressed glass shapes...Diane can do it all! 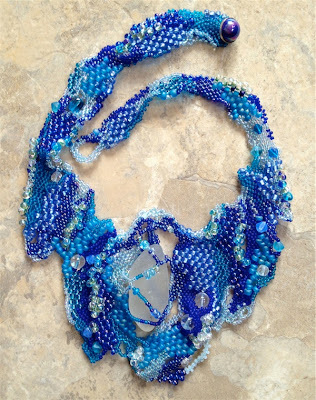 You can preview the book at two blog posts on Lark Crafts: download a PDF of the Fortune Teller Beads necklace project from the book here and see a preview of photos of projects in the book and download a PDF of the beautiful Midnight Snowflakes necklace project here. So I thought that I should do something about this wicked case of Spring Fever, and it occurred to me that you could all help! How about if we visit some far-off places and see come cool stuff, and we can do it without having to spend any extra money too...IF you will help me put it together. I've been blessed to be able to visit Guatemala, Italy, and Hawaii within the past few years, and I found each of them to be inspirational in my work after I returned. Especially when I was able to bring stuff back with me to actually use in my work! So how about it? Have you been to any cool places (they don't have to be foreign...see Hawaii above) that have inspired you and/or where you found really cool stuff to work with? Did you take pictures? Would you be willing to share some of them? PLEASE say yes! Contact me and let me know what you'd like to share...I don't care whether it's just beautiful pictures from where you went, ideas that occurred to you when you were there, or artwork that you created once you returned. Let's all get inspired together, what do you say? 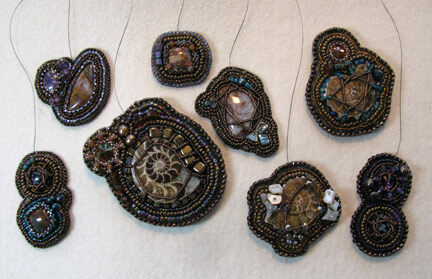 Email cyndi @ mazeltovjewelry.com (remove the spaces) and I'll schedule you for a feature on Beading Arts in April 2012. Seed beads with dichroic coating ~ fantastic! Great selection of Japanese seed beads with quantity discounts. 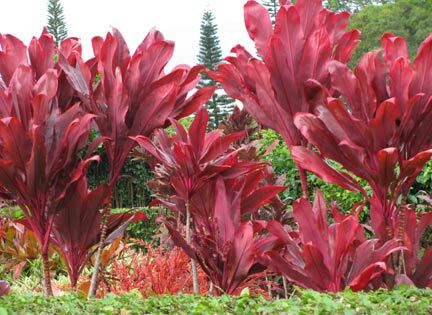 A site which tends to have all the newest shapes and colors. Any suggestions for a name? 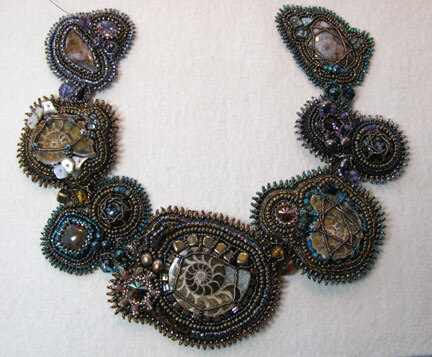 I finished this ammonite bead embroidered necklace a few weeks ago and have been busy since trying to figure out how to best share the process with you. There are so many details that I felt I could cover, especially since this is seed bead month, but I didn't want to spend four weeks on it and get all bogged down. So my "brilliant" solution is to show you the basic construction steps now and to tackle some of the details, like the bezeling, later. If you don't already have a copy of my free e-book chapter (scroll down just a bit to find the free one), which covers the basic bead embroidery stitches and walks you through the process of assembling a necklace like this, please go help yourself...I'll wait. Ok, let's get to work! 1. Here are the pieces that I made for the necklace. I tried to make a few more than I thought I'd actually need, and that worked out well, giving me a couple of options. Each of the pieces has a finished back and outer edge, but I haven't added any additional embellishment to the edges. See Chapter 1 for instructions on finishing off the back and edges. 2. Lay the pieces out and shuffle them around until you like the arrangement. 3. Use a paper pattern to determine how they should best be oriented. 4. 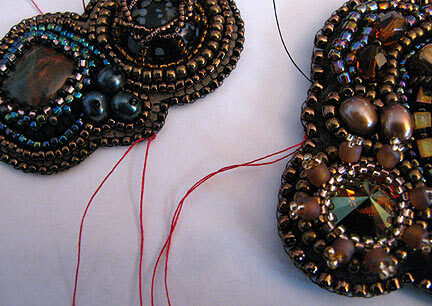 I used red thread to indicate the points at which the pieces would be stitched together with free form peyote stitch. 5. 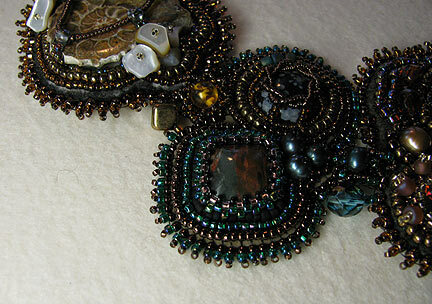 Chose some accent beads to go in between each piece. 6. 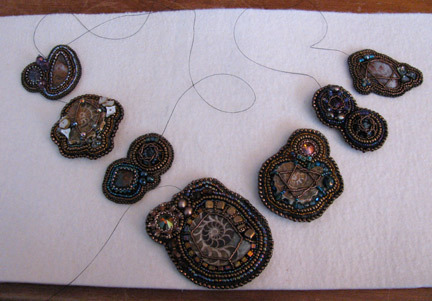 Stitch the pieces together with free form peyote stitch, maintaining the angles that will make the necklace lie nicely. 7. The pieces have all been stitched together now. Get inspired with 20+ spring jewelry designs from the Suddenly Spring Blog Hop. Carmi never tires of making buttons wearable! Melanie rocks out to the "Rose Tattoo" and it inspires a new pendant design. 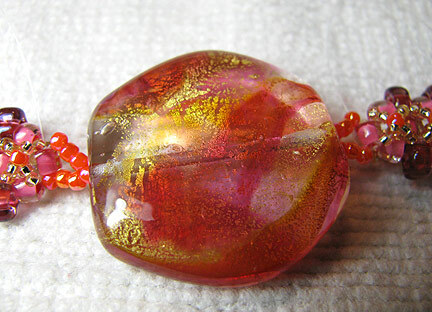 Responding to a question about transparencies and resin means we have a new pretty sample to show off! Jean jumps into Spring revealing what she made for Michelle Mach's Suddenly Spring Challenge! How fun! 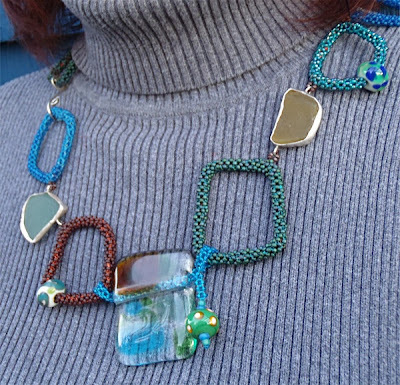 Andrew creates "Color Bundles" from enameling experiments and offers them up for sale! Have you ever thought about wearing fringe? Lisa's contemplating it after watching an episode of Sewing with Nancy! Catch up on some of the latest jewelry books recently published. Marie Cramp shares some fun ideas for making your own custom artisan components in unexpected ways. 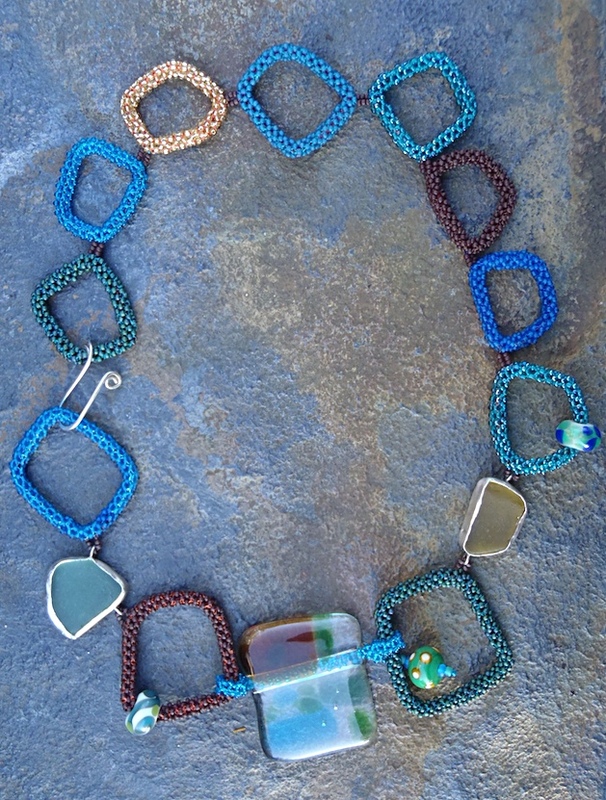 Freeform peyote with seed beads, pressed glass and trapped sea glass focal. A detail of this piece is on the cover of Karen's book. Karen, how do you describe your work? My primary interest is and has always been color. 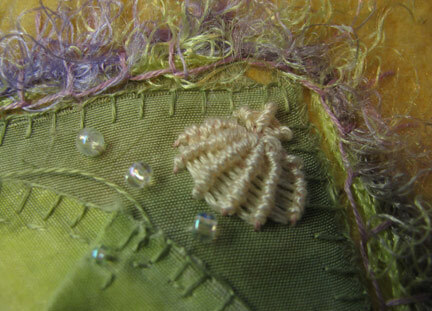 Whether I'm working with paints, dyes, fabrics or beads, color is what first draws me in. Beyond color, I love texture, both visual and physical. 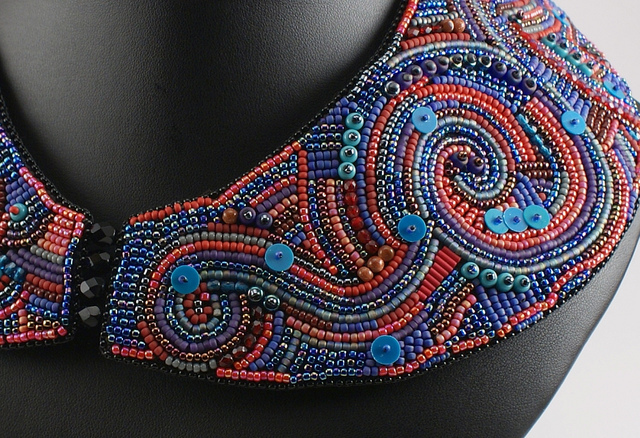 These days, I work almost entirely with seed beads; each bead a discrete dot of both color and texture with which I can paint and sculpt simultaneously, which I love. Most of my designs are abstract and for the past couple of years I’ve focused primarily on jewelry because I love the idea of it being worn, used and enjoyed. My studio’s name harkens back to the dark ages of my artistic career, in the mid 90s. As the co-owner of an art gallery, I was surrounded by art on a daily basis, but only had very limited time to create my own work. A chance conversation with one of the artists we represented made me realize that he saw me as solely a businessperson, not a fellow artist. That hit me like a blow and my art very nearly died inside me before it ever had a chance to breathe. Instead, I decided to push forward. Another conversation with one of our artists made me realize my studio (an extra bedroom in our home) needed a name. Once something has a name, it begins to take on a life of its own; names have the power to make things real. Since my inspiration is drawn from the natural world around me, I wanted my studio’s name to reflect that. We lived on a hill, so that was easy, but Hill Studio seemed a bit plain. Then one early morning while I was working out in the garden, a skunk wandered through. A skunk! My first instinct was to flee, but it completely ignored me as it went its way, poking its nose into my flower pots and pawing through random piles of leaves, seemingly right at home. Before long, I found myself simply watching this small, courageous, confident creature as its curiosity led it through my yard. I wanted that courage, that confidence, that belief in one's ability and Skunk Hill Studio was born. To this day, I periodically borrow that courage, when my own is insufficient to the artistic task at hand. A lot of my process depends upon the size of the project; the larger it is, the more time I spend in planning. With earrings, I’ll choose a color palette and a general technique and run with it. With a larger project like collar or beaded bottle, I sketch out ideas, I’ll often make paper templates to check size and placement and will stitch small samples of any question areas in the design. I have a large cutting table leftover from my days as a textile artist, and more often than not half the table is covered with a rainbow of beading packets so that I can quickly choose what I need as I work. My hands don't let me work for long stretches at a time. I try to take breaks about every hour of beading and in a typical 'beading' day, I'll spend three to five hours maximum stitching, then spend the rest of the time photographing work, playing with new ideas, organizing my studio or sketching. I carry a small sketchbook, pen, watercolor box and waterbrush almost everywhere I go and often sketch ideas while riding the bus or standing in line. And I always travel with a small bead box which is my ultimate protection from being bored. Most of my early training came from books and extensive experimentation when I couldn't find books on the topic I wanted to learn, like freeform peyote. I've never been afraid to go 'off road', which is one of my strengths. Conversely, I hate counted patterns because my artist brain is severely dyslexic and cannot create and count at the same time without causing myself considerable pain. 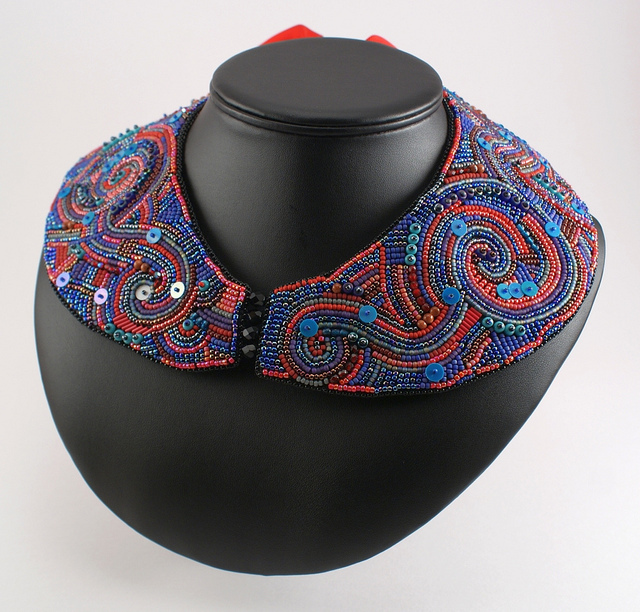 About ten years ago, an acquaintance brought a freeform peyote collar she’d just finished to a wearable arts study group meeting. It was love at first sight, and I knew that was the perfect beading technique for me. For about six months I scoured bookstores and beading catalogs in an unsuccessful hunt for instructions. Then I set out to teach myself and soon after began sharing what I’d learned with others, teaching freeform peyote locally. 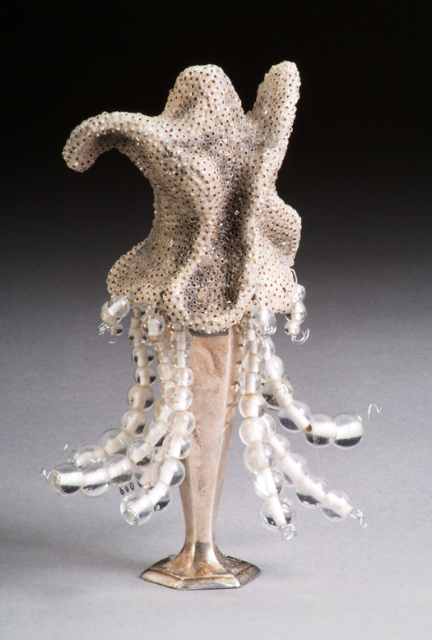 Then, in 2008 I was fortunate enough to study under David Chatt at Penland School of Craft in South Carolina. He introduced me to single-needle right angle weave and my time at Penland solidified my love of freeform beading as an art form. 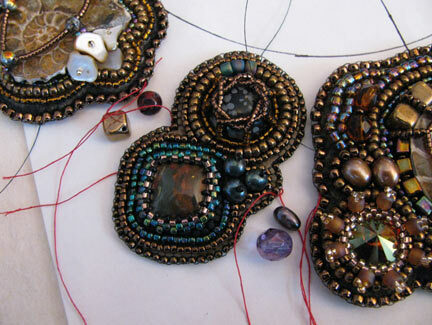 Since then, I've come to combine the two stitches more and more frequently in my work. I’ve also completed City and Guilds courses in Machine Embroidery, and in Design through the Gail Harker Creative Studies Center on Whidbey Island, which definitely strengthened my design and preplanning skills. While I have a studio full of specialty tools for this or that, my basic beading kit is almost ridiculously simple - John James sharps beading needles size 12 (the finer the better) is the only tool I simply cannot do without. Everything else is negotiable. While I love my sharp embroidery scissors, I leave them at home when I travel, substituting a pair of security-approved nail clippers instead. Beyond all else, I am a colorist, likely because for a portion of my life color was the only thing I could see completely clearly. I believe I am drawn to fine details - leaves, individual stones, sea shells - instead of sweeping landscapes for the same reason. If I could hold it in my hand, I could see it. Nature has always had the strongest pull on my senses, the colors in my work often reflecting the colors of current season. I used to have nightmares about my world going completely black; my art was a way of combating that fear, every piece a celebration that I could still see. A series of eye surgeries in my early thirties restored my vision in an amazing personal miracle, but I will never, ever take my sight for granted. Creating art is one of the ways I celebrate and give thanks. Music helps me through a lot of tough spots and I have a number of different play lists depending upon the types of work I'm doing: instrumental music when I’m working with text or numbers, Celtic music and singer/songwriters when life is good, and 80s rock when the going gets particularly tough. I'll make bargains with myself along the lines of 'you love the next song; if you keep working you'll get to listen to it, but if you stop, the music stops too'. And yes, I talk to myself in the third person, an unfortunate quirk I’ve picked up from working by myself for so many years. For larger projects, I use my circle of friends, and more recently my blog, to hold myself accountable. If I've told others that I'm going to do something, it gives me far greater incentive to actually complete the project. Beyond that, I've learned that inspiration isn't always necessary, especially in the middle stages of a project. Often, it’s simply more important to show up and keep going. "Chop wood, carry water". The hardest part is showing up. Once I've started working on any given day, momentum tends to keep things rolling. and Seedbeaders Group, and took 1st of 13 entries. Create what you love, not what's popular or what you think you should create. Play to your strengths, but don't be afraid to ask 'what if' and venture outside your comfort zone. That will help you improve your creativity in general. Beyond that, consider each piece as a whole, whether you’re painting a picture, creating a piece of jewelry or building a sculpture. In the highest quality work, every element of the finished piece builds upon the rest and is essential to the finished design. This doesn't mean that you must to plan every single step in advance, but each step, every element should be considered carefully at some point in the design process. Towards the end of a large project, when you're exhausted and ready to be done, it's really tempting to cut corners. Don't. I speak from experience when I say that paves the road to regrets and still struggle against this temptation myself. 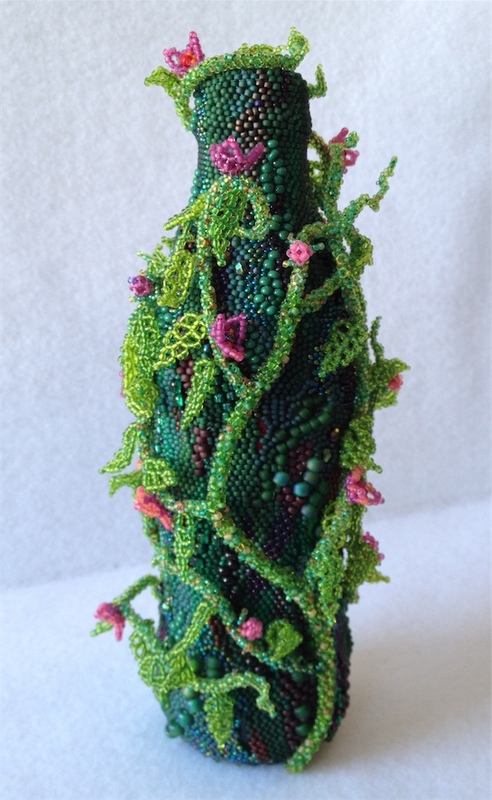 A beaded coke bottle which is the first in a planned six-pack! These days, I spend a frightening amount of my time on the computer. Besides blogging and doing my best to keep up with the other social media, I am currently working on a couple of e-patterns, one of which may turn into a small e-book. What else do you love to do? I'm an avid if erratic gardener. Living in the Pacific Northwest, my garden's green and requires work year round. Weeding is one of my favorite forms of meditation, though its definitely harder to convince myself of this when its 45 degrees and rainy outside. When I'm stumped by a project, or too wound up to think clearly I pull on my gardening gloves and head outside. An hour spent in the garden can work wonders inside my mind. I've really enjoyed the chapters of your eBook that I've downloaded! I'm looking forward to reading the others. I have a book idea of my own, and while I haven't ruled out traditional publishing, the eBook option is one I'm seriously considering. I was wondering. What made you go the eBook route as opposed to, say, using CreateSpace or Lulu.com? Is it something you would recommend? Also, do you have any tips for successfully promoting an eBook? I'm really glad you asked these questions, because I've been trying to figure out whether or not it's something that readers would be interested in. Since you asked, I think I can safely assume that there are quite a number of others who would like to know but weren't sure whether I would answer! Let me take them in order. If you can secure a traditional publisher, I would never tell you to turn it down! However, I would caution you to first read every single word my friend Margot Potter has written on the subject. Through knowing Madge, I have learned how to be very very careful about the contract you are offered. You will not get a first draft contract that is in your favor, ever. However, if you are successful with your first few books, you are then in a better position to negotiate much better terms. I'm not going to go into all the details, because Madge already has, and you should definitely read her blog diligently. I've created projects and even written chapters for the books of artist friends over the years, and I've seen what they go through. Would I ever do it myself? If I were offered the right topic by a publisher I respect (and there are plenty), yeah, probably. After having written primarily for magazines for years, I learned how difficult it is to make any real money doing this. It helps to establish your reputation, but it doesn't put a lot of money in your pocket. Plus, you are forced to sell full rights almost all the time. I had one wonderful magazine where all I was selling was first North American rights, but I don't think that happens anymore. So the publisher can reuse your work, pay you a very small amount for that reprint (I never was paid for reprints back in the day), and you have no right to reuse your work, ever. This was enough to make me think twice and even thrice about staying with traditional publishing. So, why not Lulu or something else like that? I did think about it. There were three drawbacks that applied to me, but may not apply to you. First, expense. I wanted my books to be as inexpensive as possible so that beginners wouldn't have to hesitate, and the cost of the POD books is too high. Secondly, I had a number of discreet topics that I wanted to write about, and I didn't want to have to wait until they were all written in order to publish the earlier ones. Related to that was my thought that I wanted readers to be able to pick and choose the chapters, buying only the ones that interested them. I've thought about compiling all the chapters of my first e-book, Every Bead Has a Story, and offering it as a total package. If I do end up doing this, I will still offer the chapters individually...it just feels right to me. Promotion is something that most of us struggle with. Promoting an e-book is not much different from promoting a paper book, at least the online part of it. My friends who have published traditionally were mostly shocked by how much was expected of them personally when it came to promotion. 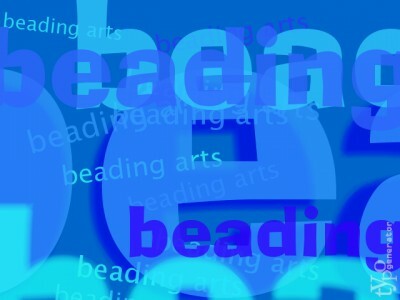 I've got lots of posts about promotion on Beading Arts, and I would also recommend Madge's blog, Problogger, and All Freelance Writing. AFW is the source of an excellent e-book by Jennifer Mattern called How to Write an E-book in Just 14 Days. Get it. It's free, and Jennifer is brilliant. So, go forth and publish...any way that suits you! 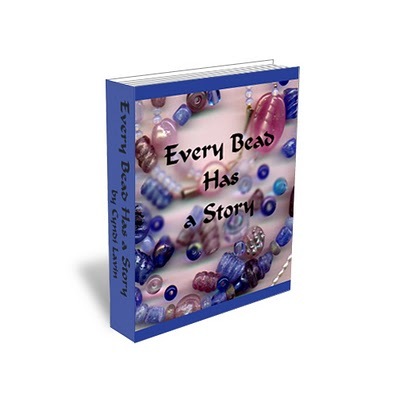 Lucky lucky Shirley, who writes Beads & Bread! She just won the copy of Right-Angle Weave that we had to give away! This was not my best result to date! Since I've worked with whipped wheel stitch before, I thought I'd get tricky and turn it into a clam shell. That would have been fine, but you can see that in my first row, where the two parts come together, I wound the thread the wrong way. I didn't figure that out until I had finished the entire thing, so I decided to leave it as an object lesson: pay attention to the basics! Depending upon how full my Take a Stitch Tuesday quilt becomes as this challenge continues, I may very well go back and add a few more clam shells. And this time I will do them properly! Jewelry artist Rie Nagumo has a way of looking at polymer clay and working with it that is completely unexpected and delightful. 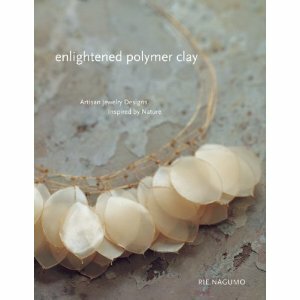 In her new book Enlightened Polymer Clay: Artisan Jewelry Designs Inspired By Nature, published by Interweave Press, the author brings her own unique sensibilities to the task of designing necklaces, bracelets, rings, pendants, and earrings using very simple techniques. There is an organic quality to Rie's designs, but also a precision in the simple and elegant forms. All the pictures come first, so you can pour over them, feast your eyes, and then go back to decide what you want to learn to make. The instructions are clear and easy to follow, with simple techniques building upon each other as the designs become more involved. There is also a bonus for the polymer clay artist, where Rie gives instructions on making metal clay links and ring forms. To be able to combine these findings with your own polymer clay designs has to be the ultimate goal for many clay lovers. Last week, I posted the first half of this tutorial plus the materials and tools list, so if it seems you are missing something here, you are! 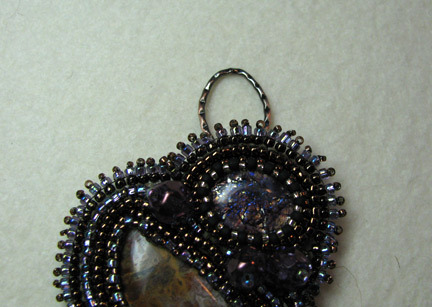 Visit Beaded Lily necklace - part one. 7. Using one of the tails, pick up 4 size 11/0 seed beads and stitch through the focal bead. 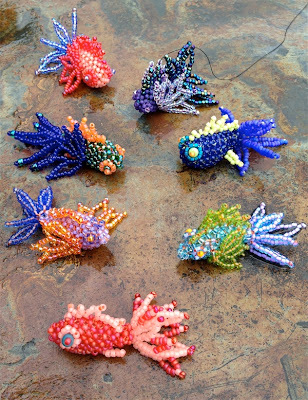 On the other side, pick up 4 size 11/0 seed beads and stitch through the closest 6/0 in the next rope. 8. 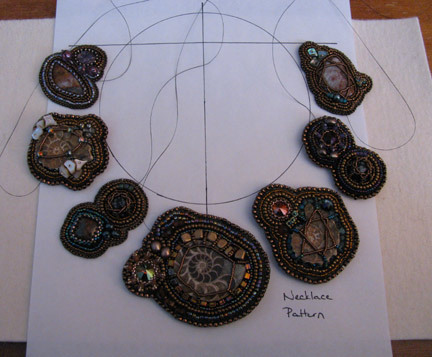 Pick up 3 more 11/0s, and stitch back through the last size 11/0 from the other group, through the focal bead, and through the first size 11/0 on the first side. Pick up 3 more 11/0s and stitch through the closest 6/0. Follow the thread path and restitch the entire thing. Work the thread tail through several more beads down the rope to anchor it. Clip the end. 9. 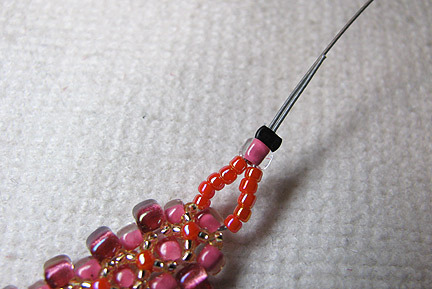 Using the tail on the other side of the focal bead, retrace the thread path at least once more, working from the other direction. 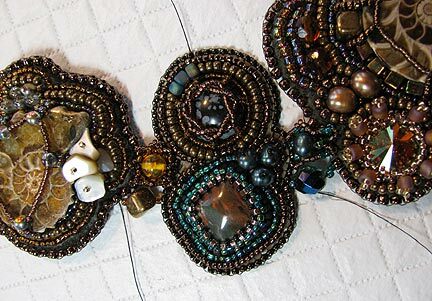 If you can do it twice without the beads being too full of thread, that will be even better. Work the thread tail through several more beads down the rope to anchor it. Clip the end. 10. 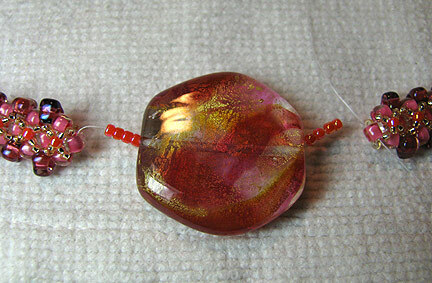 Repeat this procedure with the other two sets of tails and focal beads. 11. Cut two pieces of Soft Flex, each about 8 to 12 inches long, depending upon how long you want your finished necklace. 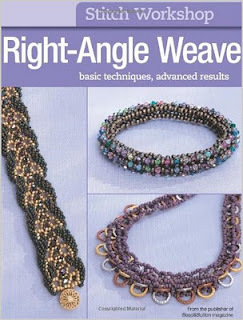 Loop the end of one piece through the size 6/0 seed bead at one end of the rope, add a few size 11/0 seed beads to both sides and string them through a size 6/0 and a crimp. Flatten the crimp. 12. Slide on a large holed crow bead to cover the crimp. 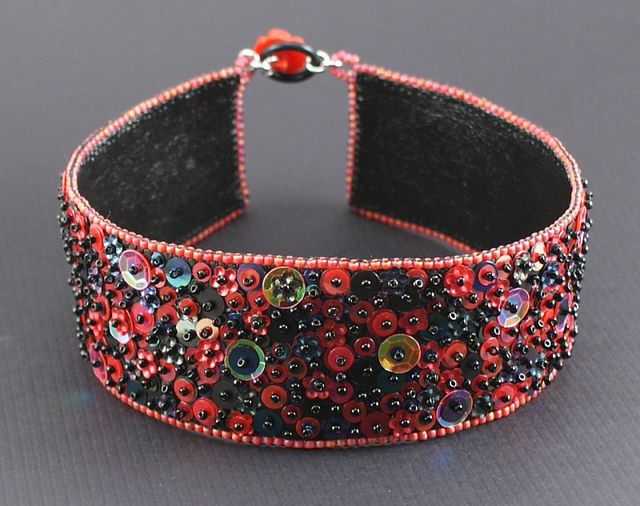 Add enough crow beads alternating with 6/0 seed beads until it is long enough to suit you. 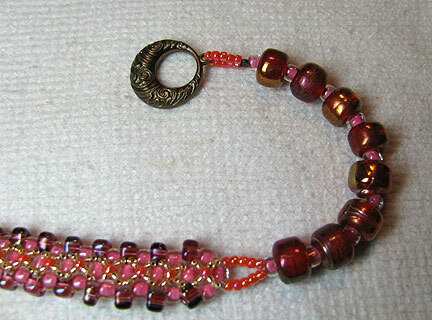 Use additional 11/0 seed beads and a crimp to attach one part of the toggle. Repeat on the other side. 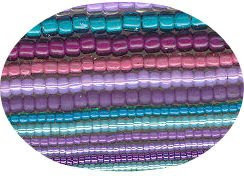 March is "Celebrate Seed Bead Month"!